To purchase and trade cryptocurrencies, you need to choose an exchange platform to trade on and while most of these charge different commission fees; there are some that do not. Here’s one of the youngest cryptocurrency trading platforms – Robinhood. Robinhood is a new kind of cryptocurrency exchange which is being gradually rolled out over the next few weeks. So far, over 4 million people have signed up to the new service, and the hype around it is growing and growing. The reason for the excitement around it is that this is a cryptocurrency brokerage exchange with a difference – offering zero commission fees on the trading of Bitcoin and Ethereum it is the first platform of its type. Based in Palo Alto, California, it first gained attention by offering a free stock-trading application which was a runaway success, leading to its announcement that it would offer digital assets for trading as well. At the moment it only offers trading in the two leading currencies, Bitcoin and Ethereum but this is set to increase as time goes on. So far it is only available in individual states in America, but this will increase to most US states and globally by the middle of the year. The company has recently been valued at $1.3 billion and is attracting a significant number of new customers because it offers the lure of quick profits, as well as providing traders with the opportunity to diversify into other assets as well. The platform was first developed in 2013 by two students from Stanford University- Vlad Tenev and Baiju Bhatt, and it was designed to bring trading to the masses through making the trading of stocks and ETFs smooth, efficient, and most importantly free. This new approach to investing has been a runaway success. It seems that this new platform is going to give Coinbase a run for its money as they seem to be targeting a similar demographic, with Robinhood having the upper hand due to its zero fees. 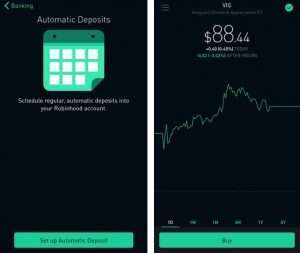 Branded as a trading app for Millennials, it also offers a feature called Robinhood Freed that gives users of the app the chance to follow cryptocurrency news as well as discuss prices and the volatility of the market. With its cryptocurrency features being rolled out slowly, the initial trading volumes are not expected to be unusually high, but as it becomes more widely available, its zero-fees and slick interface are expected to attract more and more users and interest. Transferring funds into Robinhood is pretty straightforward. After signing up and logging in, you need to navigate to the Account Menu section, tap on banking and select Tap Transfer to Robinhood. Then you choose the account you would like to transfer from (in the case you have multiple linked accounts), enter the amount you want to transfer, and swipe up to submit. You can deposit up to $50k per day into your account, and it can take around 4 to 5 days’ maximum for the money to clear. You also can set up automatic deposits should you so desire. To withdraw your funds you need to, go to the Accounts Menu, tap on Banking, and select Transfer to Your Bank. Select the bank account that you wish to transfer to, enter the amount you good-till-canceled to transfer, and tap to submit. You can withdraw a maximum of $50k per day but the funds must have been in your account for a minimum of five trading days beforehand, and it can take up to two working days to clear into your account. To comply with AML restrictions, be aware that you can only withdraw from the account that you deposited from in the first place. You may be wondering, how on earth these sites make their money if they charge zero fees. When you sign up to Robinhood Gold, you pay $6 per month, and you receive up to 2x your buying power as well as access to after-hours trading. This is the only thing that Robinhood charge for, and it is entirely optional. Robinhood will also earn additional revenue by collecting interest which is accumulated on the cash and securities that are stored in Robinhood accounts. This is the same practice in which banks make money from the money that is kept in their accounts. The ethos of the company is to provide the cheapest possible trading services for all of its customers as well as giving a pleasurable and easy to use interface for the facilitation of trades across a variety of markets. While you can log on and use the online trading platform, the preferable way to handle Robinhood is via its mobile app. While both are slick and well designed, the platform is primarily intended to be used on a mobile or tablet. 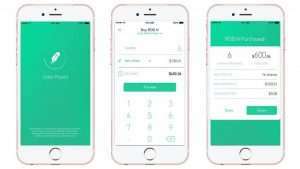 The Robinhood mobile application is free to download and of course, free to use unless you are a Gold user. It is perfect for investors that want to purchase stocks and crypto without fees and while they are on the move. The mobile application is well designed, slick and stylish as well as offering a reasonable level of functionality without being clunky or confusing to use. The application is available for download for iPhone and Android users, and it offers fully customisable alerts, a newsfeed, and the ability to listen to live earnings calls. It is easy to tell that the app was designed with Millennials in mind as it lends itself perfectly to smartphone use. The sign-up and accounting funding process is quick and painless on mobile and can be completed within a matter of minutes. The design is approachable and takes into account the needs of both newcomers and experts. It combines intuitively designed charts and historical market data and presents them in a way which is easy to interpret. Through the app, you can trade stocks, cryptocurrency, options, and ETFs in seconds and you can fully personalise your price movement, earnings, dividends and splits notifications. You can also set up your limit, stop loss, stop limit and good-till-cancelled orders via the application meaning you don’t have to access your computer to carry out these tasks. If you get stuck, then your first port of call should be the extensive FAQ section on the website. From here you will find answers to the most common questions. Should you still find, yourself stuck, there is a facility to send a more detailed request for assistance, and you will receive an answer in due course. Alternatively, you can contact them on Twitter, LinkedIn, Facebook, or via email. When it comes to cryptocurrency safety and security when using Robinhood, they are stored in a mixture of hot and cold storage. What this means is that some are stored offline where they cannot be retrieved or stolen by hackers, and some are kept online to ensure the liquidity of the platform. The company uses cutting-edge technology to ensure that all customers funds are kept safe and secure at all times. They also have several processes in place that mean any operations or coin transfers require sign off from multiple specific individuals within the company – a list that is rotated regularly for even more security. Robinhood takes additional steps to be sure that only employees that need to have access to such systems are granted it and the list of individuals is not published internally or externally. Their in-house security team makes regular reviews of all code and infrastructure that is deployed within Robinhood, and they also call on the skillsets of third-party security consultants to regularly test their systems to ensure the security of the systems at all times further. To date, they have not experienced any breaches or security issues which is reassuring. But as with any online and internet-based application, there are always risks, and the user should always take steps to make sure that they are following best practices in security, particularly when it comes to password protection. Robinhood is also registered with FinCEN which means that it is bound to the requirements of the Bank Secrecy Act as well as laws concerning money transition. It is worth noting, however, that cryptocurrencies kept in a Robinhood Crypto account are not protected or covered by the Securities Investor Protection Corporation. 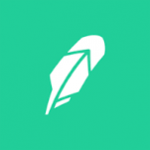 If you are based in the US, and you are interested in investing and trading in cryptocurrencies and other assets, then signing up for Robinhood is a great idea. Not having to lose any of your profits to commission or other fees means that if you are lucky with your trading, you can enjoy a higher financial success than if you are using other platforms. Also, for beginners, and particularly mobile users, Robinhood is an excellent platform as it is simple and easy to use. We believe that Robinhood could become fierce competition for other popular exchanges out there. The removal of fees puts it head and shoulders above its competitors that often take between 0.5% a 2% commission on trades. The only issue at the moment is that it is only available to users in particular US States, meaning that users in the rest of the world are not able to benefit from its uses. We hope that Robinhood will eventually roll out to the rest of the US and the world and that its zero-fees approach will incentivise other exchanges to change their modus operandi. Read more about the best cryptocurrency trading platforms. What are your thoughts on our Robinhood review? Let us know in the comments below!